Excel’s Indirect function allows the creation of a formula by referring to the contents of a cell, rather than the cell reference itself. Of all the functions covered in our Excel courses, it is often Indirect() that attendees haven’t come across but find an immediate use for, often saving a great deal of time and effort in the process. If you have several sheets, each with information for a single department for example, you may want to set up a summary sheet. Rather than creating separate formulae to refer to each sheet, Indirect() can allow you to create a single set of formulae all of which use a reference to a sheet name held in a cell – hopefully an example will make this clearer. Our Ref_text entry is a little confusing, so we have highlighted the pairs of speech marks in different colours. We have two items of text, and sandwiched in between them, an absolute reference to the contents of cell A1 – as you can see this correctly returns the contents of that cell – Cuddly toys. The ampersands are used to join the 3 elements of our Ref_Text together. The first text section simply holds a single apostrophe – this is necessary because, if our sheet name contains a space, it must be surrounded by apostrophes to be correctly identified. The second section contains an absolute reference to cell A1 – the cell where we type the name of our sheet. The third text section contains the closing apostrophe for the sheet name, together with the exclamation mark that separates sheet name from cell reference, and the cell reference itself – A2. This works well to return the contents of cell A2 on our cuddly toys sheet, and if we were to type in ‘Boardgames’ for example, it would automatically return the contents of cell A2 on a sheet named ‘Boardgames’. Note that we have to set the ‘A1’ argument of the function to ‘False’ to use this reference. RC will return the current row and column – so a formula in cell A2 will refer to A2 on cuddly toys, A3 to A3 and so on. If we need to refer to a different cell we would add numbers in square brackets after R and C. So RC would look at the cell one row down and one column right for example. Greetings. I have been using INDIRECT for some time and find it very useful. However, I can’t seem to figure out a way to use it to reference a range across several worksheets. I can get the range working okay on one worksheet, but not several. There is no indication that you can’t do this, so I am still trying. Any suggestions? This would allow me to pick up YTD figures from a series of identical mthly worksheets with just one cell change – if I can get it working. Can you help me with my query, i have several worksheets in one workbook containing different expenses, what i am looking for is to make a summary page in which the expense total of each entity from different work sheet comes up automatically every times its get changed. If I understand correctly, it depends on whether you can include a cell on each worksheet that calculates the sum of the expenses you want. If so, you could give each of the cells in the individual worksheets a different name (in case their position changes) then refer from the summary worksheet with something like: =Asheet!Asum, =Bsheet!Bsum etc. If the individual summaries cells are static you could just link to the cell reference e.g. =Asheet!C1 or whatever. Can you tell me how to propery delimited this formula? Let me know if this is what you want. I just found the indirect function, but wanted to know how to update the references, and yours helped. My case is i have two lists of ordered numbers but not all numbers are in both lists. For a quick comparison, i use (in column C) =A1=B1 (and conditional formatting to turn FALSE into read, and !FALSE to green), and drag the field to populate all the fields in column C.
The problem is that when i find a gap, i either add empty fields, or cut & paste the fields to match the other column (leaving the gap there). The purpose, is so all populated fields match. The problem was that cut&paste or adding that field, updated the reference. Hence indirect, but then indirect could not be easily automagically copied. Using this post helped. I could not quite figure our how to use your final example, but i did finally get it with =INDIRECT(“R” & ROW() & “C1”, FALSE) = INDIRECT(“R” & ROW() & “C2”, FALSE). Hi Brian – thanks very much for your comment – glad the post helped, and well done on working out how to adapt it to solve your problem. I’m successfully able to create data using indirect statements, to result in for example “John Smith”. However, I’m trying to use this as the reference for a vlookup on other data. It’s not working. What I’m finding is that I also cannot perform a simple “find” on the generated data using Ctrl-F and entering “John”, which is probably a precursor to using this as a reference in a VLookup statement. Any ideas how to make the resultant Indirect information recognizable? The find should work if you set the find options to search values rather than formulas, and indirect() should work OK as the lookup value in a Vlookup function. I’ve tried it on a simple example without a problem – could you give me a bit more information about the Indirect and Vlookup formulae you are using? It turns out that my spreadsheet was large and it was taking several minutes to calculate. I wasn’t waiting those several minutes. Everything is working now. Thanks for the help with the Indirect function. Here is my problem. When I use =INDIRECT(A1) in SheetA where A1 points to cell D1, I get the value of D1. Presumably there’s some good reason why you’re using INDIRECT() rather than just the formula =SheetA!A1? I’m adding in one row each day to SheetA, at row 1 so that the info in D1 today, becomes D2 tomorrow. However, I don’t want the reference to refer to D2, tomorrow, but to D1. Thanks Guy – I understand now – did you get it to work with the SheetA reference in the end? Yes, I did get it to work. Here’s the principle. I have two worksheets, Sheet1 and Sheet2. Column D, (D1,D2,D3, etc. ), in Sheet1 needs to call the data from Column A, (A1, A2, A3, etc. ), in Sheet2. However, since I am adding rows above row 1 in Sheet2 on a daily basis, I still want D1 in Sheet1 to call from A1 in Sheet2. The problem is that if I want to add a row to Sheet2, all of my references increment by 1 in Sheet1 so that D1 in Sheet1 points to A2 in Sheet2 and not to A1. Note: There is no “=” sign before the entry. Now I pointed D1 on Sheet1 to A1 on sheet1 using the indirect function shown below. Since A1 is text and not a formula, no “=” sign, it does not increment when I add a row to Sheet2, which means that it will always point to the same absolute reference. Therefore; Cell D1 in Sheet1, calls the info from Cell A1 in Sheet1, which in turn calls the information from Cell A1 in Sheet2. =INDIRECT(Sheet2!A1) which returns a #REF. I think that should avoid the need to enter the text in column A. I hope I’ve understood correctly this time. Simple, when you know how. I have been using the Indirect function for quite sometime. But I have always used it to refer to values on some other worksheet of same workbook as you have shown in your example. can we use it to refer to value of cell in another work book save some where without opening it (like we use links) this will help us to change the path of the file in one cell and hence the values. I am trying for the same but its not working and always gives me #REF ! error. Any help available on this issue. If you just want to replace the sheet name entry using Indirect() then the following should cope – it uses whatever is entered into cell A1 as the sheet name, or were you after something different? could please help? I have looked and some people say there diffrent type of referencing and that you could use maybe undirect,? is that rigth? even tho I am java developer to be honest i am stuck with this, could you pleaseee, see if you can solve this? I have just tried this, it keep througting errors , doesnt like the sysntx, maybe it’s me, can i send you the workbook please?? I’m trying to use one of your earlier examples to fix a problem in our softball registration spreadsheet. I’m trying to count the number of players in a given league but I keep getting an error. The first sheet “Roster” contains player info and column B has the league values 6U, 8U, 10U, and so on. to count the players in the 8U league but as we insert/delete players my references get clobbered. where cell T4 contains the value “Roster” (without the quotes). Alas, I get the dreaded #REF! error. Any ideas? I can’t immediately see a problem with your INDIRECT() formula. Is there any chance that a stray space could have been entered somewhere? Including the single apostrophes to allow for a sheet name with spaces is generally a bit safer as it allows for sheet names with intentional spaces: =COUNTIF(INDIRECT(“‘” & T4 & “‘!$B$4:$B$500″),”8U”). I’d try changing the Roster sheet name and the entry in T4 to check for a problem with the sheet name first. Which version of Excel are you using? You might find a simpler solution is just to use an Excel list (2003) or table (2007 or 2010) which will automatically adapt your formula to reflect insertions or deletions. Alternatively, If the performance penalty isn’t a problem and there is no other structural reason not to, you could apply the formula to the whole of column B: =COUNTIF(roster!B:B,”8U”) – insertions or deletions shouldn’t be a problem then. Thanks, Simon. I tried the apostrophes and also renaming the sheet but that didn’t help. I am using Excel 2010 but haven’t had time to look into using a table yet. For now, I was able to move some cells around and drop back to picking up all of column B. Thanks for the suggestions. Problem solved…. this one works =COUNTIF(INDIRECT(“‘”&A1&”‘!$B$2:$B$5″),”a”). It looks very similar to what I posted above. I am not sure what makes it work now. Hi Daniel – glad you got it to work. Did you type the formula in from scratch the first time or use copy and paste? The double quotes definitely look different. I think the WordPress editor might format them in some way so if you did copy and paste the reformatted ones would not be recognised by Excel as double quotes and this would cause the error. Glad you found the post useful. I also need help with the indirect function. I’m getting the wrong information with my min formula. My Sheet name is called “PX” and I’m trying to find the minimum of column “U”. Using the formula: =MIN(PX!U:U) it returns the value 2.19. If I use an indirect function to replace the sheet name I get a different answer! =MIN(INDIRECT(“‘”&A2&”‘!$U$2:$U$299”)) The answer is 2.67. (where A2 has the text “PX”)….I don’t understand why I’m getting a different number. Any help would be extremely appreciated. Thanks. Sorry if this is stating the obvious, but which cell is 2.19 in. If it is in U1 or below U299, then that would explain the problem. If you have already checked that, what happens if you reproduce the original formula exactly as =MIN(INDIRECT(“‘”&A2&”‘!$U:$U”))? 2.19 is the min(U:U) in sheet PX. I tried the original formula as well and it still doesn’t return the correct value. It returns 2.67, not 2.19. So frustrating ! Sounds very odd – you’re very welcome to email the spreadsheet to me to take a look. If you duplicate your indirect formula into another cell on the same sheet, then replace all the Indirect bit with the sheet name does that give the right answer? I have just recently started using the indirect function but I was wondering how do I combine it with the max/min function to get the max and min values. These values will always change as a new sheet is added in each week, and also the row would change each week to depending on where in the order people bat in. This is the formula I am using to calculate the total runs for each person each game they play =SUMPRODUCT(SUMIF(INDIRECT(“‘”&Games&”‘!A2:A100”),A5,INDIRECT(“‘”&Games&”‘!B2:b100 “))). Could you include all the data in one sheet with an additional column to identify each game? That would make the formula much easier or you could perhaps use a PivotTable. Thanks for your reply. Can’t really include all the data in one sheet and I tried using a pivot table but that gives me N/A errors especially when some people play in one game and not another. I have got Indirect to look across multiple sheets already for other areas(total runs scored, balls faced, wickets taken, overs bowled etc), but my problem is getting the max and min values from those multiple sheets for each player especially when the players change (i.e. they play game 1 but don’t play game 2). I am trying to link data from rows in one worksheet to columns in another worksheet.Some cells in the source worksheet are empty but I don’t mind if the result returns zeroes for those cells in the destination worksheet. I basically took my first worksheet and transposed it to another so the data is already there. I just need it to update when source cells are changed.Source worksheet name is COMP DATA EXPERIMENT (2). Data is in rows 3-174.Columns P-BX. Preferably adding a new row in the source WS won’t mess anything up. I am very inexperienced with functions and have tried several internet suggestions without success. I don’t relish the idea of using ‘ =’ for each and every cell to link data as that is about the extent of my Excel knowledge. I know.Very sad. But I am a writer, not a number cruncher so any help would be eternally appreciated.BTW I also don’t mind if I am able to do this column by column. If a mistake is made, it would be easier to backtrack. Either way. I did do an array on the separate worksheet and it gave me some unexpected results in that I was unable to delete any rows or columns to isolate my data. I can’t remember the message it gave me when I tried to modify it …something along the lines of ‘if you modify this worksheet, your firstborn will die’ or something like that .LOL. I wound up deleting the worksheet and starting over. So the array solution doesn’t seem to work for me. To transpose (which I already did successfully) AND link ( which I couldn’t do) is my dilemma. Any other ideas for the Excel illiterate like myself? Yes, one of the ‘features’ of an array formula is that you cannot change or delete part of it. How about using one sheet to transpose the whole set of cells using the TRANSPOSE array, and then refer to the individual cells you want on the ‘transposed’ sheet from a third sheet. This should keep the link, but give you the flexibility. I am refering 116 row in sheet1 to 3rd row in sheet2, hence the +”113”. Now my question is how can I change my above INDIRECT function formula so that I have a way to refer to n-th row in sheet1 to 3rd row in sheet2. Not sure I fully understand, but you could replace the &ROW()+113 with a reference to a cell that contains the number of the row you want? Hi Vipul – I think a PivotTable might do what you want. With the codes as the row labels and values in the data area. =VLOOKUP($G$2,sheet1!$A555:$F570,2,FALSE). The cell $G$2 on sheet2 contains the value which is the criteria for selection. Now my problem is the range which I have specified in the formula is fixed. How can I change it to variable range taking the values of start point from one cell & ending point in another cell. I mean I should be able to select any range based on values specified in some cells in sheet2. Could you please help? Thank you – your discussion helped me to get Indirect to work; I had never used it before. Appreciate the insights! Thanks for taking the trouble to let me know that it had helped. Thanks a lot for the exceptional content. I wish a lot more pages like this could be discovered in the big g.
All I am getting these days is horrible youtube clips and incredibly few informative articles and websites. Seems google is only focused on the bucks now; such a shame. I am creating a budget template that will be used for next year and future years. There is (and will be) a seperate file for payroll and benefits each year. The file that contains the entire budget will pull payroll and benifit totals from the PR and Benifit file. The file names will have the exact same wording with the exception of the year. I have a single cell in the budget file that the year will be entered. in order to have a flexible formula, I feel I need to use the INDIRECT function along with CONCATENATE to utilize the changing years. To get the correct numbers in the budget, i will also need to use the SUMIF function as i have multiple companies and departments. The first INDIRECT statement designates the criteria range and the second INDIRECT designates the summing range. Any chance you can figure out what I am missing or doing wrong? I would greatly appreciate it. Thank you so much in advance! Hi Mark – I haven’t worked it all through in detail, but a few things to be aware of that might help. Make sure that the workbooks that you are referring to are open – I don’t think INDIRECT() or SUMIF() work if the external workbook is closed. You might also try using the Formula Auditing Tools, Evaluate formula option to evaluate each element of your formula step by step to see if you can spot an issue. Also, I’m not sure you need to mix the use of & and CONCATENATE() -it might be easier if you stick with one or the other. If the formula still doesn’t work, I’d start breaking it down into its constituent parts to identify where the error is occurring – for example you could use SUM() to see if the range element of the SUMIF() is working in isolation. If none of this helps, please do come back to me and I’ll set the problem up in detail to see if I can find the answer – unless anyone else gets there first! To add to my reply. Another useful trouble-shooting technique for INDIRECT() is to enter the argument of the function (preceded by = to make it a formula) into a separate cell. This will show you the text that INDIRECT() is being asked to work with. Create the formula you want to use as a ‘normal’ formula, and compare the two. Simon – I am trying to use the indirect formula in a Vlookup. I can get it to work referencing one cell as the sheet name =VLOOKUP(“Subtotal Direct Costs”,INDIRECT(“” &A3&”!A:P”),10,FALSE) where “A3” is the sheet name, but lets say the sheet name in this case “Fido” is actually Fido Oct 13. Fido is in A3 and Oct 13 is in E2. How do I use both A3 and E2 to get the sheet name so my vlookup works? 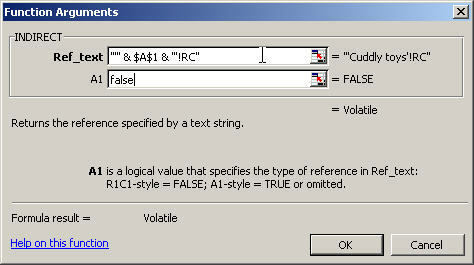 I have tried =VLOOKUP(“Subtotal Direct Costs”,INDIRECT(“” &A3&E2&”!A:P”),10,FALSE) but I get the #REF! I figured it out! I was missing the ‘before the cell range in !A:P.
Well done – sorry not to answer before you worked it out for yourself, but you probably found it more satisfying that way anyway! Would use the contents of cell A2 on Sheet2 as a cell reference, so the contents of this cell would itself need to be a valid cell reference. For example, if sheet2!a2 contained: ‘sheet3!a1, the formula would compare the contents of sheet3!a1 wth the word test. The formula is placed at Z2. The Y2 cell contains how many rows there of the first item listed on Admin P2 through to P19. Cell y3 will have the count for the next item. Cell Z1 contains a constant value of Deleted. Other constants are in AA1:AC1 The intention is to copy it down 300+ rows and across three more columns. Can you help me find out why the formula is returning #Value!? I haven’t checked this does what you want exactly, but it should be a valid formula that you could adapt. I have a feeling that there might be a more straightforward way of achieving what you want. Have you considered using OFFSET() to deal with the variable range – =COUNTIF(OFFSET(Admin!R2,0,0,Y2,1),$Z$1)? The W2 is a cell using the Match function to find the begining row and the X2 cell again uses Match to find the ending row. This forumula was copied over 3 more columns to pick of the other Status values that I needed to be able to verify for each item. Thank you again, you really helped me and I appreciate you sharing a viable alternative. Hi John – glad you got it to work. Many thanks for letting me know and for including the completed solution and explanation. I found a work around. I changed my Qty formula to put in a number of -1 if the adjacent column’s cell was blank and then copied that formula down to row 500. Then I put in a conditional formula to change the font to white for any cell with a number of -1. At first it didn’t work becase the -1 had been put in as a text -1. Once I got everything set to use a number -1, then it worked. I got this idea from a web site which I can’t seem to find today. You were so helpful on my Indirect function, that because I started out trying to find how to use indirect capability in vba, I felt I could at least ask you a question here. It is OK with me if this is something beyond the scope of this site to pass on my question. My issue pretains to using vba from recording a macro, I need to sort two columns. 1st is a numbers column and I want it to be highest to lowest and the second sorted column in ascending alpha order. I need a way to deal with less than 100 items initially and on up to 500 down the road. I recorded the marco to unique two different sets of 2 column data. Then to sort those two sets by the number column of the set from highest to lowest. Excel sorts the set ok, but puts the blank rows first – not very helpful to have to scroll down through 400+ blank rows. The vba code below has several different attempts based on searching the web, they are commented out for now. The code does everything, but sort the blank rows to be below the rows with data. ‘ Record the Unique values for Course Title and Clicked by to their respective places at column U & W.
Can you offer any suggestions on how to get Excel using vba to leave the blank rows at the bottom after a sort? i would like to drag and copy this formula but the cell value should increase by intervals of 21 so the next formula is =Indirect(“‘JUL’!A3”) and so on. How can i change my formula so that i can drag with this particular interval? This assumes you are copying down to contiguous rows and always starting in row 2. Thank you for your post, extremely helpful. I am trying to reference a cell in another worksheet which contains text, and some words need to be bolded. The indirect function is doing everything that I want it to do, EXCEPT that it does not return the bolded words (just shows up as unformatted text). Is there any way to reference exactly how the text in the target cell is formatted i.e. showing the bolded words? Hi Vanessa – I’m glad you found the post helpful. I’m afraid I don’t know of a way of doing what you want with the INDIRECT() function. 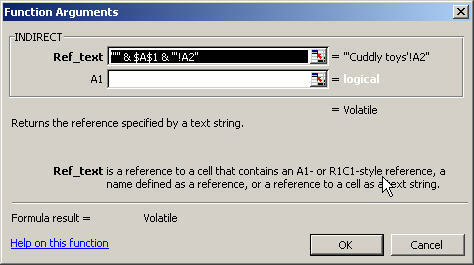 Cell references, whether using INDIRECT() or not, tend to just return the cell contents without the formatting. I have seen VB code that would do it. 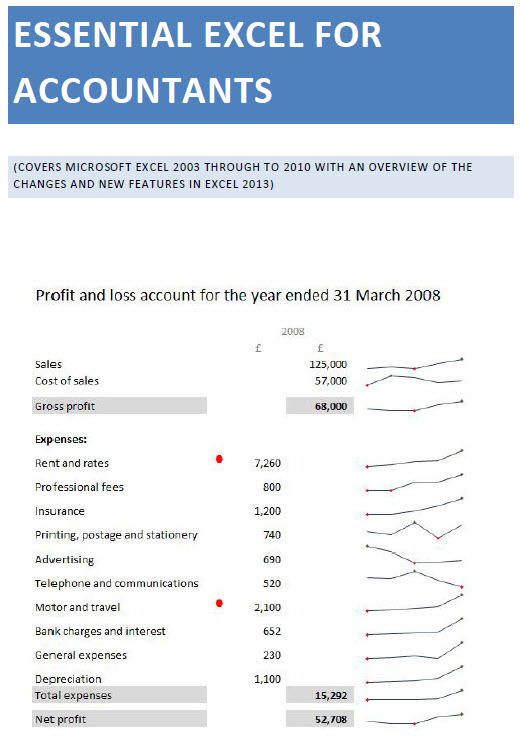 Depending on what you are trying to do, it might also be worth investigating the Excel camera – this can ‘take pictures’ of Excel cells on other sheets or workbooks that update as the source is updated: http://www.tkb.co.uk/excelcam.htm. Also worth noting that INDIRECT() will return an error if it refers to another workbook that is not open. I hope this helps. I have built a sheet that looks for specific documents on the server. I am running into an error I cant seem to resolve. I have three boxes that use drop down menus to select you search. The first just refers to a list, the second box uses =INDIRECT($B$7) to look at the result of the first box and find the list for box two. The third box uses =INDIRECT($C$7) to look at the selection in box two to find the list for box three. However the INDIRECT function in box three gives me an error saying “The source currently evaluates to an error”. Is this a limitation? If I copy the source content from box one and paste it in box two, it works but is looking at box one. When I change $B$7 to $C$7 I always get the error. Any ideas? I am trying to make an automatic Contract system in Excel. Where i want to have one cell in one sheet where i enter a name, example : John Wayne and i want it to then get an entire sheet with contract info. (Made many sheets with detailed information on each employe and their contracts. and used their names as the name of the worksheet) Hope you did understand what i ment? To sum it up i would like to make a sort of lookup system that looks up in the sheets names in a way. I would like to help my managers to easly find a persons contract info in a “search mode”. Pardon my english, since its not my native tongue. I am stuck at what seems easy, and I can’t wrap my head around it. I have multiple sheets, and I want to count occurences of a specific word (“French”) in a specific cell (C3) on all sheets. Not easy at all. The obvious function, COUNTIF(), doesn’t work with 3D formulae. This link contains some suggestions: including using a third party add-in. The other suggestions rely on typing in the sheet names and using INDIRECT() with an array formula or SUMPRODUCT() equivalent. Good luck!